Kids with No Sleep Make Mom Grumpy: Tips on Getting Kids to Sleep! Kids don’t realize that when they don’t sleep mom doesn’t sleep and that makes mom very GRUMPY! The good thing is there are some things you can do to get your kids sleeping all the way through the night, so you both wake up in good moods. The first thing is to learn how many hours of sleep your kids need. Remember, if your child is a baby or toddler some of those hours will include naptime during the day. It’s easy to tell when your child needs a nap, because he’ll show signs of his own grumpiness and when he does his first moan and groan, put him in for a nap immediately. Then make sure that he gets the rest of his sleep at night, so he meets his daily requirements. 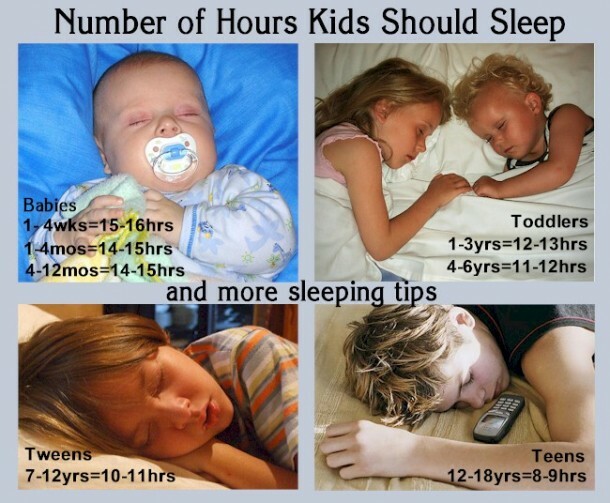 Below you’ll find the correct number of hours your child should sleep to ensure that he has his best day ever. You’ll also find other helpful tips. 1. Get the Right Mattress for Your Child’s Bed! Make sure that your baby and toddler have firm mattresses to give proper support to their growing bodies. When your child reaches school age consider getting a softer mattress or adding an egg crate to make the sleep space a little softer to encourage a longer night of zzzzzzz’s. 2. Keep the Room Temp Cool. Make sure your child’s room temperature is cooler rather than warmer. Between 67 – 70 degrees is the perfect temperature for kids to get some sweet dream time. 3. The Darker the Room the Better. If your kid insists on having a night light make sure to put it somewhere lower than the bed, so the light isn’t shining directly on your child. It’s actually best if the room is very dark. 4. Create a Bedtime Routine. If you make a bedtime schedule that includes some down time before bed like reading books, brushing teeth, taking a warm bath, instead of stimulating things like TV or action packed play, then your child’s chances of getting to sleep fast are definitely increased. 5. White Noise is a Plus. Kids tend to wake up when they hear strange noises, so getting a white noise machine or fan for their room is a great idea. Having that constant lull will keep your child’s mind peaceful allowing him to drift off to dreamland in no time. 6. Foot Massages Work Every Time. If your child really has some serious trouble falling asleep, then give him a foot massage right before bed and his eyes will be closed within minutes after you’re done.